The idea of sitting-room furniture designed like an ice-cream sounds a bit out there – would that be a round lump? Or a cone? But Jellio (strapline: fun by design) have designed a bench based on a ice-cream slider and the result is sweet and retro. Made from solid foam, it’s 48 inches long and would be good for a kids’ playroom. 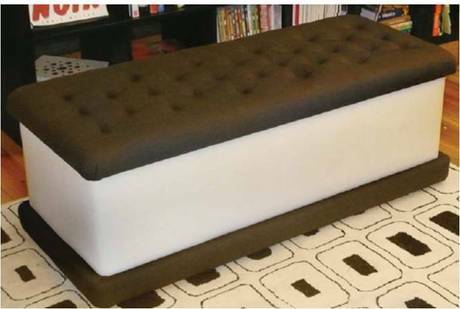 Not cheap though, at $950.You can get matching cupcake stools too. 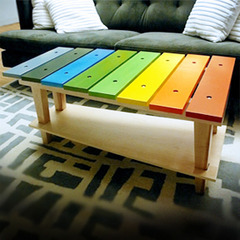 They draw inspiration from other unusual places for some of their other products – look at this coffee table based on a xylophone. Yes, it really does work as well. A bold colourful piece which would add a little fun and colour to a room and also provide something to play Mary’s Little Lamb on. oww desgin of eating things now used for make seating things….great concept.